Engagement and wedding rings have a long history. Rings have been used as symbolic tokens for centuries, and understanding the history of engagement rings can help a couple realize just how significant these pieces of jewelry are. Furthermore, couples interested in antique rings may find a greater appreciation for the changing styles knowing how the jewelry's history has evolved. 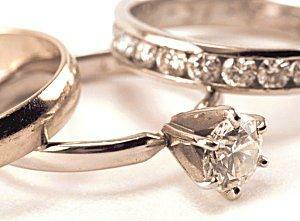 The initial origins of engagement and wedding rings are the same. The earliest uses of symbolic rings are attributed to different peoples, including the ancient Greeks, Romans, and Egyptians. Betrothal rings were meant to symbolize a woman's connection to the man who would become her husband, though the arrangement was more of a business proposition than a romantic union. Romans used iron rings to symbolize strength and permanence, and the Greeks are credited with the initial idea to wear the ring on the fourth finger of the left hand, where the "vena amoris" or vein of love was supposed to connect to the heart. During the ninth century, Pope Nicolas I endorsed the idea of engagement rings by making a gold ring a betrothal requirement to demonstrate the groom's wealth and ability to care for a wife. In 1215, Pope Innocent III made a similar declaration though the rings could consist of different metals, including silver and iron, and the rings were meant to be worn during a longer engagement period. Established engagement ring history has theorized that the first rings may have been made from leather, plants, or other degradable material that served not only to symbolize a union between two people, but also their connection with the land that sustained them. As time passed, metal rings eventually became more elaborate, finally incorporating gemstones to add a measure of distinction and beauty. Symbolic patterns of birthstones were often used to illustrate the couple's parents as well as the couple themselves. For centuries, however, diamonds were too rare and expensive to be widely available or affordable. The first recorded diamond engagement ring was given to Mary of Burgundy by her betrothed, Archduke Maximillian of Austria, in 1477. Few details are known about the ring itself, but diamonds were considered at the time to have magical powers relative to love, purity, and fidelity - the same characteristics they symbolize today. In the late 19th century, extensive diamond deposits were discovered in Africa, effectively making the gems more widely available and cheaper for the general public to purchase. Because of the sudden abundance of diamonds, designs became more elaborate and intricate, and more brides-to-be began to receive diamond engagement rings. The story of men's engagement ring history is far shorter. For centuries, only women received either engagement or wedding rings, but today the vast majority of men wear wedding rings, and an increasing number also receive engagement rings. This trend began during World War II, when many men were faced with years separated from their loved ones, and simple rings served as reminders about the people they'd left behind. It has taken still longer for diamonds to be incorporated into men's rings, but many masculine diamond rings are available today. 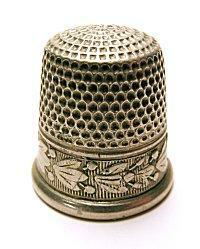 Thimbles were practical alternatives to engagement rings. The Puritans who helped colonize the United States refused to wear most jewelry, including wedding and engagement rings, because such baubles were considered ostentatious and frivolous. Instead, a betrothed couple would exchange a thimble - a practical item a young woman could use as she sewed linens and clothing for her dowry. After the wedding, the thimble's cup was often cut off (symbolizing that her dowry was complete), and the rim could be worn as a ring. Non-diamond engagement rings have been popular throughout most of the United States' history because of their lower expense and easier availability: this was especially critical during westward expansion and pioneer days when any ring was costly. During the 1920s, art deco designs were particularly popular because of their modern symmetry and flashy color contrasts, while smaller rings and more elaborate filigree designs were popular during the Great Depression because of their affordability. During World War II, at the same time many men began wearing wedding rings, platinum rings were prohibited (the metal being necessary for military uses), and many more gold and silver rings were designed. Despite the varied nature of wedding and engagement ring history, today's trends are clear: custom rings unique to the couple are more popular than ever, as are contemporary styles that illustrate the promise of a future that is brighter than ever. Even as diamond jewelry continues to evolve, its ties to historical tradition remain intact, and couples continue to honor that history by exchanging rings as they form their own traditions.